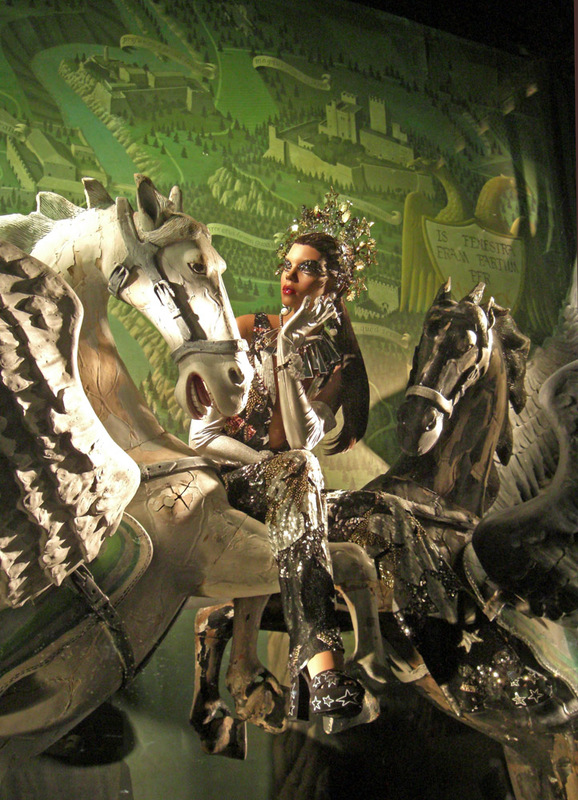 "Destination Extraordinary" is the theme for the 2016 holiday windows at Bergdorf's. Everything green is called into play to carry out the theme: leaves, trees, ponds, bugs, cacti. It's hard to pick a favorite but I'll go with the pair of winged horses holding aloft a tiara-clad dreamer in fabulous star-studded shoes. The painted background looks like a renaissance map of the grounds of a chateau. The worn antiqued texture of the horses contrasts with the pensive dreamer's disco-era garb and makeup. It makes you think. It makes you stop and stare. That's a successful window.